The pace of contemporary life has never moved so fast,’ says Copenhagen-based artist John Kørner, while peddling comically slowly on his bike installation at Victoria Miro’s Wharf Road gallery in London. The bike is attached to a moving platform topped with a stall of chairs built for visitors, parallel to a vast, 12-panel painting charting a sunrise and set. The installation is designed to ‘slow us down, and see the painting from a different perspective’. 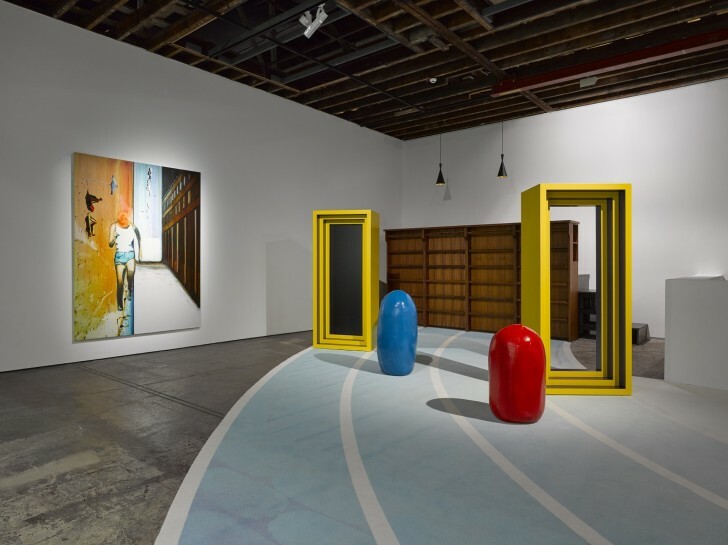 The exhibition – ‘Life in a Box’ – revolves around the physical, emotional, and conceptual constraints of time passing, and the ways in which we attempt to ‘outrun’ them. Kørner depicts runners in cross-country garb, shifting in-and-out of focus into vivid yellow and red backgrounds, as if we’re just missing them as they zoom past. In the upstairs gallery, a sweeping, floridly-coloured race track covers the floor; the finish-line dissected by a giant climbing frame that also functions as a bar, which Kørner encourages you to climb up, and order a shot.